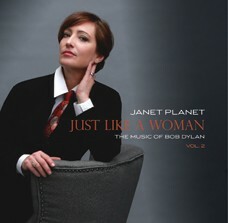 JUST LIKE A Woman: When the poetry of Bob Dylan meets the colors and rhythms of jazz, something harmonious happens. Janet Planet's vocals caress, belt and soar, over big band arrangements by Fred Sturm, Tom Washatka and Matt Turner. Bob Dylan's stories like you've never heard before!